Lammas Blog Hop | My favourite Pentacle…. Welcome to the OTHER Game of Thrones! My Tarot blog concentrates on the 16 characters of the Tarot Court and my goal is to help demystify these cards and ensure that readers have a wealth of ideas to draw upon when the cards arise during a reading. And to have a bit of fun with them too! If you’re interested in improving your relationship with the Tarot Court, please click to follow Tarot Thrones…over there on the right hand side. You may be here because you are hopping from Christiane’s blog to Joanne’s blog or vice versa for the Lammas Tarot Blog Hop or you may have just wandered here via a tweet or facebook. Whichever path you have followed to find me, I am very glad to see you! In this Blog Hop, we were to look at our favourite Pentacle card. Because my blog focuses entirely on Court Cards, I’m keeping within that structure and limiting myself to choosing from the four courts (how very Pentacly!). It’s a no-brainer – it’s got to be the Knight of Pentacles for me. And my favourite image of him is this one, from the Pamela Colman-Smith Commemorative set issued by US Games Systems. I hold my hands up – I admit it, in the past I have been easily seduced into bed by the fiesty Knight of Wands….intellectually challenged by the prickly Knight of Swords and utterly charmed by the romance of the Knight of Cups. At a party, the Knight of Pentacles probably wouldn’t have got a second glance from me. Although I might have sent him off to the bar to bring me back a drink. 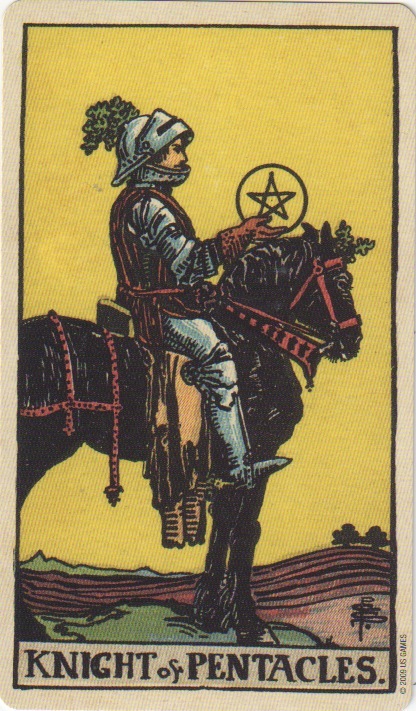 And yet, as I get older, I appreciate more and more the qualities of the Knight of Pentacles. I love the practical streak that allows him to carry out so many small jobs with a quiet confidence that leaves the blustering Knight of Wands weakly reaching for his wallet. The Knight of Pentacles has an intimate knowledge of valves and screws and the workings of machines. He may put on a show of being reluctant to help out, but his fingers dance over the various cogs or screws. The Knight of Swords, on the other hand, frantically flicks through the instruction manual looking for clues as to what needs tweaking. Or thumped with a hammer. And the Knight of Cups? Let me share a story with you. When my son was born, 12 years ago this very week, there were another three women in the ward whose babies arrived soon after mine. Their husbands brought them bouquets of blooms that scented the ward with tendrils of scent from exotic lands…..armfuls of red roses in crackling sellophane sleeves and gas-filled balloons that bobbed up to ceiling height when they escaped their boxes, trailing ribbons and perspex bubbles with either a blue or pink teddy bear inside. An inkjet printer for my computer. Practical. And the source of much hilarity amongst the new sleep-deprived mothers. This Knight is loyal, hard-working (check out those immaculately ploughed furrows! ), strong and resilient. But he’s not yet got that outward mastery of The King – the Knight can also be unbearably stubborn (see: outright refusal to read the operating instructions before using an appliance), unable to pay you a compliment without some irritated prompting from yourself and he is totally bamboozled by your need to own more than one pair of black high heels. And if you decide to have A Deep Conversation one morning in bed as you both sup your cups of tea – good luck! A ‘Deep Conversation’ for the Knight of Pentacles is one that is held down a mine-shaft. I once heard it said that the Knights of Wands and Swords would be the first into battle, followed by the Knight of Cups (who is probably composing a sonnet in his head about the war as he canters towards the fighting). And the Knight of Pentacles? He would be the last to venture into the fight, but once he was there, he would be the last to leave it. And the only one to buy you a printer for your computer…. Nice writing and I especially like the Knight of Pentacles at a party reference, in younger life. I just caught up/read this but LOVE that story. What a lovely way you have of making the characters of the Tarot come to life! And what a thoughtful and useful gift you received that brought to you a beautiful memory many times for many years. How very pentacly. Thank you Teresa! He's totally Pentacly. And it looks like our son is heading the same way. Which is great. But as a Wandsy sort of person myself, it can feel a bit booooooooring to be surrounded by motorbikes under repair, scaffolding under repair….and endless blocks of Lego being fashioned into spaceships. I love your style of writing, and your personal insights into the courts are delightfully witty and insightful. I particularly enjoyed the printer story, which made me realise that I am, after all, at least a little bit of Earth; I loathe cut flowers – I like to see all nature's gifts in their own environments – and would much rather have a printer! This particular Knight of Pentacles did consider buying me flowers, but knew that I would appreciate (and indeed NEED) a printer. I'm not sure what that says about me in all this though lol! I understand him so much better now. Great post. I love this blog in general. So many people have a hard time making the Court cards real people; this is a great help to tarot students everywhere. This particular post is so funny, and so true. I am so loving this one! I picked up my Knight of Pentacles and laughed out so loudly as I read your blog. Thanks for the giggle! Wonderful personalities expressed and I love the loving humor. A deep conversation with his Knight of Pentacles self being one down a mine shaft. LOL! Thanks for the abundance of personality here, Alison! And, I full-on dig the expression of timing in how each of the 4 Knights goes in in his own particular way. Great stuff here! I picked the Knight of Pents as well for wholly diff reasons, and dig how they complement. Great work! I was quite depressed to realise that I am starting to value Pentacles more than anything else when it comes to my partner. He used to be a Knight of Wands when he was younger. He morphed when I wasn't looking! I've got a Knight of Pentacles, too. He asks me to tell him what I'd like and then he orders it for me online. 😀 Actually, mine is a Page of Cups with a big dose of Knight of Pentacles. Ponder that one. oooh interesting combination – how does the Page interact with the Knight?! Yes- Bringer of Printer, Hooverer of Stair Carpet AND Buyer of Shoes, that's him! He is TOTALLY the bringer of printers. And Hooverer of Stair Carpets.